"Gun shot" and "Gun Shot" redirect here. For other uses, see Gunshot (disambiguation). "Gunfire" redirects here. For other uses, see Gunfire (disambiguation). A gunshot is a single discharge of a gun, typically a man-portable firearm, producing a visible flash, a powerful and loud shockwave and often chemical gunshot residue. The term can also refer to a ballistic wound caused by such a discharge. 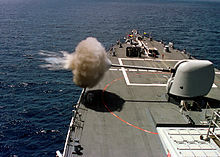 A muzzle blast which occurs when high-pressure gases within the barrel are suddenly released and rapidly expand when the projectile exits the muzzle and the bullet-bore contact that maintained the seal is removed. A typical muzzle blast generates a shock wave with a sound pressure level (SPL) of 140 dB or louder. A whip-like “snap” or “crack” caused by the sonic boom that occurs as a projectile moves through the air at supersonic speeds. Gunfire can be confused with other noises that can sound similar, such as firework explosions and cars backfiring. Gunfire noise propagation is anisotropic. The sounds may be heard at greater distances in the direction of bullet travel than behind or beside the gun. A suppressor can be attached to the muzzle of a firearm to decrease the auditory signature of the high-velocity gases released from the muzzle when firing the weapon. The sound of firing is only decreased, however, and is still considerable. Suppressors attached to the muzzle will not reduce the sound of high velocity gases released from other locations, such as the gap between the cylinder and barrel of a revolver. A muzzle suppressor is similarly ineffective in reducing the snap of a supersonic bullet or the noise produced by the mechanical action of a self-loading firearm. Use of suppressors is rare in United States crimes. A 2007 study estimated unlawful suppressor possession was involved in only 0.05 percent (1 in 2,000) federal criminal prosecutions; and the suppressor was unused, but simply in the possession of the defendant for 92% of prosecutions involving a suppressor. ^ Horman, B. Gil. "Sound Suppressors 101". American Rifleman. Retrieved 27 November 2013. ^ Bradshaw, Tony. "Targeting the Source of Illegal Gunfire". Esri. Retrieved 27 November 2013. ^ Clark, Paul A. "Criminal Use of Firearm Silencers" (PDF). Western Criminology Review. Retrieved 15 September 2016.